As for those saying my credibility is simply lost, because other people said otherwise doesn’t really actuall address the discussion itself here. All I see is him reading in-game cues and getting a lucky streak of shots, that isn’t uncommon in the game at all for someone who’s proficient with the game. The mechanics of this game is still not exactly on par with games like CSGO. It doesn’t take much for a proficient and dedicated player or a comp player to start coming close to emulating esports players like Jikka and relaaa, at least mechanically. there’s a lot more to what puts those caliber of players in a league of their own anyway. Snapping in this game is still markedly simple, basically maneuvers still set you well on your way to controlling most recoil, audio cues (when they work) are oppressively strong, enemy players come with inconsistent and irrational skill gaps in player matches.... Jack isn’t doing anything any of you couldn’t do with the right learning mindset instead of one of denial and conspiracy theories. Right.. so what? What does that mean about anything.. anything at all? Was just something I could imagine happening, but whether or not it's true, it doesn't matter in the slightest... but bravo on picking out one sentence of my post and getting all /sigh about it. Well done. What are you getting so worked up over that comment. I said what I said. I dont care if it doesnt matter or not. So you think that dice whitelist a hacker ? @Micas99 If you really believe, why are you buying their games? There's a conspiracy among people here that dice supports the cheating market. You add a twitst to that. You think they white list hackers yet you own BF1,BF3, BF4, BF5. All games Jackfrags played on and made content for. Do you believe he was cheating since BF3 days? I personally wouldn't buy a game from a company I thought supporting cheating in anyway. It makes no sense to me why someone would think dice supports cheating yet still buy their games and complain that they don't do anything about the cheating. If you think they support cheating, why buy the games? Why wrote paragraphs on paragraphs if you think dice is cahoots with cheaters? It makes no sense. The conspiracy is really far fetched in my opinion. I agree with someone who said if you don't think dice is doing enough, don't buy their games. People keep coming back and its on them for buying the game. Do you think they will do a better job at the anti-cheat thing? The answer is a big fat No. But still people keep buying the game over and over again and the same thing keeps happening. People will never learn. If you look at the way the sales of BF5 tanked and the way EA's stock price tanked (>50% since last summer), it would seem pretty obvious that people aren't buying the game.. and that's likely going to be a continuing trend assuming there is even a next BF game. It's safe to say, the next bf will look totally different than bf1 and bfv art sytle. I don't think they want to remind people of the previous two titles. I'm for it. I think they will go to a grittier tone and something more photo realistic. I'm hoping anyway. I just don't see that argument and I have to disagree. I don't think Jackfrags matters to the point you seem to suggest. If shroud, ninja or even drdisrespect streamed this game consistently, I think it would do more to help Battlefield than it would if Jackfrag did it everyday. I don't think he's an influential as people are making him seem. I also don't think he's that good as people are making him seem.People are making it sound like jackfrags would drop 100-7 on you. That's not the case. Just go review his stats. Frankie was always trash. I remember being barely able to run the Crysis 3 multiplayer alpha on my outdated rig, and I headshot Frankie one time with a sniper rifle (one of the few kills I even had in that match) and he cried a river over it, calling me a noob. A single death. Now Jack and LevelCap were always annoying, downloading and re-uploading official content and drowning out the actual audio with their annoying voices... "As you can see here, this guy is holding a K98, so that will be in the game. He's shooting at a guy using a stationary anti-tank gun, so we know AT guns will be in the game. The grass is green, so we know it's not snowing. The characters are alive, so there's oxygen in the game...." It just gets painful. Westie is tolerable and has some good insight, but the way he says baah-l-field gets me. After watching Stodeh, he's no doubt good at quickscoping. Seeing some of his clips of firing into smoke, either his clip started after someone was downed and he aimed above that player, or a medic could have used smoke for a push and (probably knowing head height) he got some lucky snipes on people. Wasn't like the JackFrags video where he was consistently tracking and shooting non-3D spotted enemies through trees. Some streamers do cheat, but already have enough skill to not need to rage, and are able to conceal any external UI. Probably not front page official channel streamers, but streamers nonetheless. "As for those saying my credibility is simply lost, because other people said otherwise doesn’t really actuall address the discussion itself here." You have not addressed the time stamped points in the video with any pertinent clarification explaining his extremely calculated hit placement through smoke. Either do so, or let it alone. You have only spoken in vague generalities regarding the video and gone on about your audio, while caqrefully avoiding the substance of my post about the video. Watch the video frame by frame if you need to, then get back to me. Tell me exactly what you see happening that causes these hits. These are not random moments of spray by any stretch. 371.33. They are making millions but so many viewers don't realise they are using ESP hack and think it is their skill. There is an option to hide the ESP from the streams and recordings. 90%of the multiplayer game streamers are using ESP hacks which are hidden in the stream in all the other popular online multiplayer games people are watching. Will AMD Cloud Gaming Stop the Hacks? Even Dr. Disrespect can't avoid PC cheaters. I disagree about there being ESP wallhacks and aimbots on PS4 and Xbox One. As far as I know those consoles haven't been jailbroke so no unsigned cheat software can run on them. I stop to play when kids arent at school and play. That all. I submit lot of players to EA too, never had a real reply except "we do our best, sorry about ..." So what ? Does we must cheat ourselves too perhaps have any chances against than those real kids ? I'm so sad about that... that a real good game, and those cowards kids just killing it ! i'm 51 years old, almost of them just reply "ur a **** ! Ur a kid, learn to play..." sure... scored 80 and more kills and die oinly 6 or 8 times with 3 full teams against them, one shoot everybodies ... if EA cant find a real solution almost of normal players will just leave that game and never more buy any product. Would you like me to change your forum ID to match? Rubbish mate. You can't use those type of hacks on console. The bootloader it's locked. I mean nobody can avoid cheating on PC. Not even Dr. Disrespect. Cheating is PC gaming's achilles heel, and only seems to get worse with each passing year. The majority of streamers their skills are above average at best tbh. There are a few exceptions such as shroud for instance, but he has a history as a competitive CS player. Relaa has played Quake if I recall and he does miss shots, it just needs a keen eye to spot how quickly he corrects his aim. 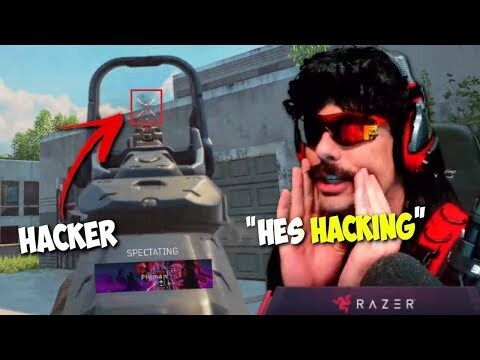 DrDisRespect isn't that great of a player on PC, but he makes up for that with the persona he's created while streaming. There are also players who have a unique playstyle they've mastered that seems weird to a lot of people.